Clara M. (Meade) Kiefer, 89, of Cincinnatus, NY, passed away on Friday, November 23, 2018, at the Crown Park Nursing and Rehabilitation Center, Cortland, NY. Born in Port Dickenson, NY, on May 16, 1929, Clara was the daughter of the late Everett and Virginia Winfield Meade. 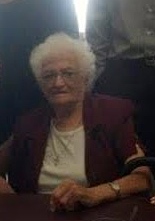 She was a communicant of Our Lady of Perpetual Help Catholic Church where she was a former Eucharistic Minister and a member of the choir and Altar and Rosary Society. She retired from Gladding Corporation and had also worked at Cortland Corset prior to their closing. In her spare time, she served as a volunteer at Cortland-Chenango Rural Services. She is survived by her nieces, Bonnie Meade of Binghamton, Barbara Cole of Johnson City, and Becky (Daniel) Stroka of Great Bend, PA; a nephew, Edwin “Buster” Meade of Binghamton; and a sister-in-law, Beverly Meade-Nesley. She also leaves behind several friends, including Doris Russell, Eileen Callaghan, and Logan and Mardie Wehner. She was predeceased by her husband, Clarence Kiefer; brothers, Lee and Albert Meade; and a sister, Peg Normile. A prayer service will be held at the K.L. Sharp Funeral Home, Cincinnatus, NY, on Tuesday, November 27, 2018, at 1:00 p.m. Burial will be in Sylvan Lawn Cemetery, Greene, NY, at the convenience of the family. The family will be present to receive friends at the funeral home from 12:00 p.m. until the start of the service at 1:00 p.m. Expressions of sympathy in memory of Clara may be directed to Our Lady of Perpetual Help Catholic Church, 2708 Lower Cincinnatus Rd., Cincinnatus, NY 13040, Cortland-Chenango Rural Services, 2704 Lower Cincinnatus Rd., Cincinnatus, NY 13040, or Cincinnatus Emergency Squad, c/o Elaine Oros, 5771 McFarlane Rd., Cincinnatus, NY 13040.